Glinton & Northborough Amber Under 15s are pictured before their 7-2 win over Malborne Rangers. They are from the left, back, Jack Crane, Matt Roe, James Connell, Isaac Woodfield-Mills, William Barfield, Ruben Harry, Nigel Thomas, front, Max Sambells, James Smith, Tommy Paul, Oliver Hill, Jonny Hook and Daniel Froggitt. Yaxley Under 16s may be struggling in the Peterborough Youth League, but there’s nothing wrong with their cup form. 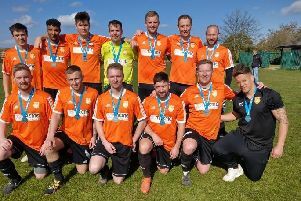 They were away at Somersham Town Colts in the second round of the Hunts Cup on Sunday and cruised to a 9-2 win. Action from the game between Glinton and Northborough Amber U15s and Malborne Rangers. Star of the show was Alfie Webb, who fired six of the goals with the others coming from Arunas Arcisauskas, Joshua Stimson and Finley Kilby. In Under 16 Division Two, Baston narrowed the gap on leaders Holbeach United Gold to five points with three games in hand when they hammered Holbeach United Black 8-1. William Howarth led the way with a hat-trick and Jack Brumfield bagged a brace as Baston made it four wins out of four. In Under 16 Division Three it’s Netherton Hawks flying high at the top. They were 6-2 winners over Park Farm Pumas Red on Sunday thanks to goals by Cyrus Hussain (3), Joel Bearman, Adam Lock and Dylan Wright. Yaxley are the new leaders of Under 18 Division One. They went top, one point ahead of Bourne Town Blue, following a 2-1 win against Hempsted United. Rory Nicholson and David Ibrahim got their goals. There was double delight for Parkside in the Under 12 Hunts Cup on Sunday with both their teams smashing the opposition for six. Pictured is the Malborne Rangers Under 15 side beaten 7-2 by Glinton and Northborough Amber. From the left they are, back, Ashdon Strangward, Benjamin O'Shaughnessy-Darr, Ricardo Jamanca, Liam Weston, Jacob Smith, Shayne Costen, Michal Pawelek, front, Oren Spivak, Jayden Stevens Steele, Will Yorke, Ethan Clasper and Kalam Kenton. Parkside Yellow were away at Godmanchester Colts and they triumphed 6-0 thanks to goals by Rodrigo Silva (4), Marcel Klimowski and Jayden Harrison. Parkside Blue, who play in Division Two of the Peterborough Junior Aliance League, were at home to Division Five side ICA Sports and they cruised through 6-2. Also in the Hunts Cup, IPTA beat stablemates IPTA Oranges 1-0 courtesy of a Warren New goal. In Under 12 Division One, Crowland stay top after a 1-0 win over Peterborough Northern Star White. In the same division, Thorney Colts were big winners against Colsterworth Colts Reds. They won 8-1 through goals by Max Britton (3), Alex Evans (2) and Enos Kumadoh (3).